By the time you finish this sentence, computer hackers from around the globe will have made at least 1,000 attempts to breach the Pentagon’s electronic wall. With sheer persistence, malicious determination and a little luck, some of these virtual intruders may eventually break through—just as they do to corporate-maintained networks in the civilian world with alarming frequency. But in military cyberspace, trespassers don’t go undetected and they don’t get far, thanks to a small but growing group of digital commandos with U.S. Army Cyber Command. Corps—and a broad array of military intelligence and national security personnel. But reinforcements are on the way. A lot of them. Some 600 soldiers, civilians and contractors—and their families—will move to Augusta as part of a military plan to relocate U.S. Army Cyber Command from Maryland to Fort Gordon over the next few years. They’ll join personnel streaming into other cyber-related units to create a 3,700-person strong workforce wave by 2020. On a 21st century battlefield, these will be America’s front-line troops—the people who will take out the enemy by taking out their information systems. “The next war is going to be won by whoever can get into the other guy’s computer systems first,” says Thom Tuckey, director of the CSRA Alliance for Fort Gordon. “Right now, there are two kinds of militaries in the world—those who’ve been hacked and those who don’t know they’ve been hacked.” As a retired colonel and Augusta’s chief military liaison, few outsiders know more about what goes on at its newest and most publicized military unit than Tuckey. The former fort garrison commander also knows a little bit about the base’s most secretive cyber tenant—the National Security Agency—but he doesn’t say much. Nobody at the fort does. There’s a reason the NSA is jokingly referred to as “No Such Agency” in the intelligence community. What is known is that the NSA’s 600,000-square-foot, state-of-the-art surveillance center—discretely called NSA-Georgia—will house most of the base’s cyber warriors in a 170,000-square-foot addition. Intelligence analysts have called it the largest “spy” facility in the world. Though the military and NSA share many of the same information systems, its personnel has a wholly different mission: monitor and decode electronic communications from Europe, North Africa and the Middle East. Both teams ultimately report to the same boss—Adm. Michael S. Rogers, a four-star general based at NSA/U.S. Cyber Command headquarters in Fort Meade, Md. Rogers made national headlines in the fall when he testified before the House intelligence committee that China and “one or two” other countries have the ability to shut down the U.S. electric grid and other critical systems with a cyberattack. He said adversaries remain ready to disrupt networks running everything from chemical facilities to water treatment plants by performing electronic “reconnaissance” on a regular basis. “All of that leads me to believe it is only a matter of when, not if, we are going to see something dramatic,” Rogers said. Defending vital American networks and cracking enemy codes is a booming business at a time the rest of the military is downsizing to pre-World War II levels. In fact, forts Gordon and Meade are the only two installations expected to have net growth during the next few years. Some reports have estimated Fort Gordon’s cyber growth, which includes U.S. Navy and Air Force personnel and civilians, as high as 4,000 people. Unlike fort personnel of decades past, these new professionals will be highly skilled and highly paid, with salaries starting at $50,000 for noncommissioned officers and exceeding six figures for commissioned officers and upper-level civilians. While cyber warriors might not be the chattiest people at a church potluck or cocktail party, their massive influx in the coming years will bolster the regional economy in a manner not seen since construction of the Savannah River Site a half-century ago. ago. The post-war tech buildup there helped create a metro area of 300,000 that boasts a 40 percent college-educated population and one of the South’s highest per capita incomes. Existing companies are expanding operations too. Raytheon Corp., which has had an Augusta presence for two decades, already has made plans to trade its Perimeter Parkway office in for a bigger one in the next few months. Bob Damen, the company’s point man in Augusta, says any defense firm hoping to be a player in the cyber industry will want a local presence. “We haven’t seen the full effect yet, but it’s on its way,” he says. Dealing with all those extra commuters on Augusta’s streets, particularly the estimated 3,700 additional cars passing through the fort’s already-congested gates, will be one of many challenges locals face in accommodating the buildup. Metro Augusta already is teeming with experienced tech professionals thanks to the Signal Corps, which runs the Army’s IT and telecommunications systems. About 1,800 soldiers—many of them tech-savvy—separate from the Army every year at the fort, with about 45 percent deciding to remain in the area. Each one is a potential employee or entrepreneur. Large corporations are just as eager to poach tech-smart talent, including global IT firm Unisys Inc., which last year announced it would locate a 700-employee support center in Augusta. The Fortune 1000 firm, whose clients include the Army, Dell and American Airlines, was driven primarily by the region’s pool of skilled workers, says Walter Sprouse, executive director of the Augusta Economic Development Authority. “There’s a great deal of talent here from people who have either served or are serving at Fort Gordon,” he says. The National Science Center Foundation certainly appears bullish on future office demand—it has begun marketing its 56-acre parcel outside Fort Gordon’s Gate 1 as class–A professional space. When the spouses, children and other dependents of cyber-related employees are factored in, local officials expect the Fort Gordon buildup to attract anywhere from 10,000 to 14,000 new people. That translates to more demand for housing, schools, retail, healthcare, social services and general public infrastructure. “There’s going to be a demand for more of everything,” Tuckey says. fort will help support anywhere from two to four positions in the community. The expansion’s impact on the local tourism industry is more tangible. Because business trips and family/friend visitation account for two-thirds of Augusta’s visitor market, a bigger fort population automatically translates to business for hotels, restaurants and entertainment venues. “You’re going to see some investment in the private sector support that growth,” says Barry White, director of the Augusta Convention and Visitors Bureau. “Cyber Command will definitely be on every developer’s radar.” White says TechNet Augusta, the fall symposium held by the Armed Forces Communications and Electronic Association, is expected to grow beyond the confines of the city’s convention center when it returns for its third year. “That’s a very positive sign,” he says. Dealing will all those extra commuters on Augusta’s streets, particularly the estimated 3,700 additional cars passing through the fort’s already-congested gates, will be one of many challenges locals face in accommodating the buildup. A new fort entrance near Lewiston Road—between Gate 1 at Jimmie Dyess Parkway in Augusta and Gate 2 at Robinson Avenue in Grovetown—has been pitched to make sure notorious D.C.-style traffic jams don’t occur here during peak shift changes. Other pressing concerns are the nearly 2,000 children expected to enroll in public schools, primarily in Richmond and Columbia counties, because of the fort’s proximity. Other pressing concerns are the nearly 2,000 children expected to enroll in public schools, primarily in Richmond and Columbia counties, because of the fort’s proximity. Richmond County, which anticipates taking on as much as one-third of the new arrivals, has the capacity to absorb more students, but not at schools closest to the fort. Columbia County, being the faster-growing market, likely will end up educating the largest share of children—likely in portable classrooms. Because the fort can’t count solely on out-of-towners to meet ongoing personnel needs, Georgia Regents University has been working with the military to determine how to build upon its existing undergraduate IT program, which offers basic and advanced certificate-level curricula for students seeking a cyber-security focus. The cyber education summit GRU hosted this past October—which featured Adm. Rogers as keynote speaker—generated useful suggestions from attendees nationwide, including officials from universities with more established cyber security programs, such as Georgia Tech, Mississippi State and University of Texas-San Antonio. The cultural impact of new cyber warriors will likely be felt in the arts community, which tends to attract newcomers whose passions include dance, music or theater. GRU Assistant Professor Joanne Sexton, a U.S. Navy veteran who served as the first commanding officer of what is now Fort Gordon’s Navy Operations Information Command, is taking the lead in curriculum development efforts. She says GRU’s long-term goal is to become one of the National Security Agency/Department of Homeland Security Centers of Academic Excellence in Information Assurance/Cyber Defense, a designation that—though awkwardly worded—is regarded as the gold standard in cyber defense education. While GRU hopes to establish an employment pipeline to the fort, Sexton says there will be even more private sector demand for security-focused IT professionals. “Every company today has a cyber-security need,” she says. Some are calling Augusta the future “Silicon Valley” of cyber security. Certainly, being ground zero for the military cyber defense industry will bring economic growth and infrastructure changes that are sure to make Augusta look different. But it’s the influx of young, upwardly mobile professionals—who look as much geek as G.I.—that will make Augusta feel different. A similar change in social fabric occurred decades ago when thousands of mostly non-Southern professionals flocked to new jobs at SRS. Many of those workers, as well as out-of-state transplants attracted by GRU and Fort Gordon, decided to stay for good. 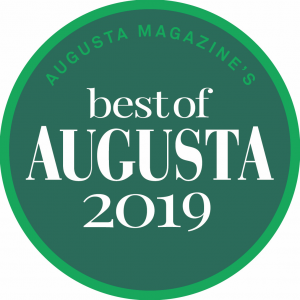 Augusta rubbed off on them, but they in turn helped change the community through civic involvement and their regional tastes in food, fashion, sports, arts and entertainment. Because of Aaron’s job assignment at Fort Gordon, the newlywed couple had the option last year of relocating from their home in Charleston, S.C., to one of the agency’s three regional operations centers, one of which is near Honolulu. Rory, the digital director of a Charleston magazine, was initially excited at the prospect of a new life in the Pacific. “I thought that if we were going to do this, then I wanted to go all in,” she says. But that all changed after spending some time in the Augusta area. The Kentucky native rekindled her childhood interest in horses, attending an equestrian show in Aiken, and they both fell in love with a 1929 English Tudor for sale on the Hill. Plus, the short drive from Charleston meant she could still keep her mostly web-based magazine job—with the occasional long-distance commute—as well as her home-based interior design consulting business, e-Design. Tuckey, who grew up an “Army brat,” says the infusion of new blood ultimately will change the community in a positive way, as he expects the typical cyber warriors will be patriotic, civic-minded and have a diversity of life experience and knowledge that many natives can learn from. Any one of them could someday be a future community leader, he says, such as the entrepreneurial Zapata, who is active in his church and volunteers in the community through a local Rotary Club. Don’t underestimate the power of Southern hospitality. It’s one reason why Army Cyber Command is in Augusta and not Baltimore, Md. A computer “worm” believed to be the work of a Russian spy agency had infiltrated SIPRNet—the Department of Defense’s secure version of the Internet—and was attempting to steal top-secret information. Apparently, an American solider stationed at a military base in the Middle East inadvertently introduced the malware on a USB flash drive that he found in the base’s parking lot—an espionage tactic known as a “candy drop.” The worm could scan computers for data, open backdoors and transmit information to foreign servers undetected. It was the worst computer breach in U.S. military history. On June 23, 2009, Gates established U.S. Cyber Command at Fort Meade under Gen. Alexander. The appointment earned him a fourth star and put him in charge of the warriors in the military’s newest domain—cyberspace. The next major development was establishment of the Army component of U.S. Cyber Command on Oct. 1, 2010. It began operations in earnest out of multiple facilities spread across NSA’s home turf, and Fort Belvoir, Va., home of the U.S. Army Intelligence and Security Command. Fort Meade and Fort Gordon were the logical choices for a permanent home. Meade was in the backyard of Sen. Barbara Mikulski, D-Md., then-chairwoman of the powerful Senate Appropriations Committee, but Augusta had much more. There was great synergy with Fort Gordon’s existing tenants, including the NSA and the U.S. Army Signal Center of Excellence. The installation also boasts multiple intelligence units and the military’s largest satellite training facility. Plus, military officials determined consolidating operations in Georgia would be 23 percent cheaper. And it didn’t hurt that the base had been a secure facility long before 9/11 and that its 56,000 acres offered the Army plenty of room for future growth. But Fort Gordon’s most attractive attribute was the community outside its gates. “If people didn’t want to move to Augusta, it would have been very difficult,” says former Sen. Saxby Chambliss, R-Ga., who was vice chairman of the Senate Select Committee on Intelligence. During an interview from his new office at Atlanta’s DLA Piper law firm, Chambliss says the metro area’s quality of life was the clincher. “Some didn’t know what to expect, but what they soon found out was Augusta was a good place to live,” Chambliss says. “There were a lot of folks who came to work at NSA who said they didn’t want to leave. That type of attitude was prevailing during discussions about the location of Cyber Command. Understanding how metro Augusta fits into the nation’s cyber defense operation can be confusing. Here’s a primer. National Security Agency/Central Security Service (NSA/CSS): Established in 1952, the NSA collects and analyzes foreign intelligence from communications and information systems. CSS, created in 1972, integrates the armed force’s military intelligence elements. NSA/CSS has had a presence at Fort Gordon since 1994 and currently operates out of the 600,000-square-foot John Whitelaw Building near the corner of 4th Avenue and 16th Street. U.S. Cyber Command (USCYBERCOM): Activated in 2009, the Fort Meade, Md.,–based cyber warfare division is charged with defending U.S. military networks while disrupting those of its adversaries. Its commander, Adm. Michael Rogers, also serves as dual director of the NSA/CSS. U.S. Army Cyber Command (ARCYBER): Created in 2010, the Army component of USCYBERCOM is the service’s warfighting cyber force. The Pentagon announced in Dec. 2013 its headquarters would be relocated from Fort Belvoir, Va., to Fort Gordon by 2020. U.S. Army Cyber Center of Excellence: The Fort Gordon-based U.S. Army Training and Doctrine Command institution, formerly known as the Signal Center of Excellence, was renamed in April 2014. The center will operate both a signal school and cyber school, write cyber warfare doctrine and consolidate the various military, NSA and industry-standard courses required for cyber operator proficiency. It will be completed in 2018-2019. Fort Gordon: Among other things, the 74-year-old base is home of the U.S. Army Signal Corps, which has made it the center of the Army information technology and communications activities in recent years. Expansion of cyber warfare missions promises to make metro Augusta’s largest employer even larger. Adm. Michael S. Rogers: The four-star general is a Chicago native and graduate of Auburn University. He directs the National Security Agency/Central Security Service, the world’s largest intelligence organization, and oversees U.S. Cyber Command and the military divisions that comprise it, the Second Army, 24th Air Force and the Navy’s 10th Fleet. Lt. Gen. Edward C. Cardon: The Texas-born soldier’s military career includes service in Germany, Bosnia and multiple tours of duty in Iraq. He was overseeing the 2nd Infantry Division, the U.S. force helping defend South Korea, when he was named commander of Army Cyber Command in 2013. Maj. Gen. Stephen G. Fogarty: A Georgia native, Fogarty assumed duties as the Commanding General, U.S. Army Cyber Center of Excellence and Fort Gordon in 2014. His career in military intelligence includes commanding the fort’s NSA-Georgia facility from 2005 to 2007.